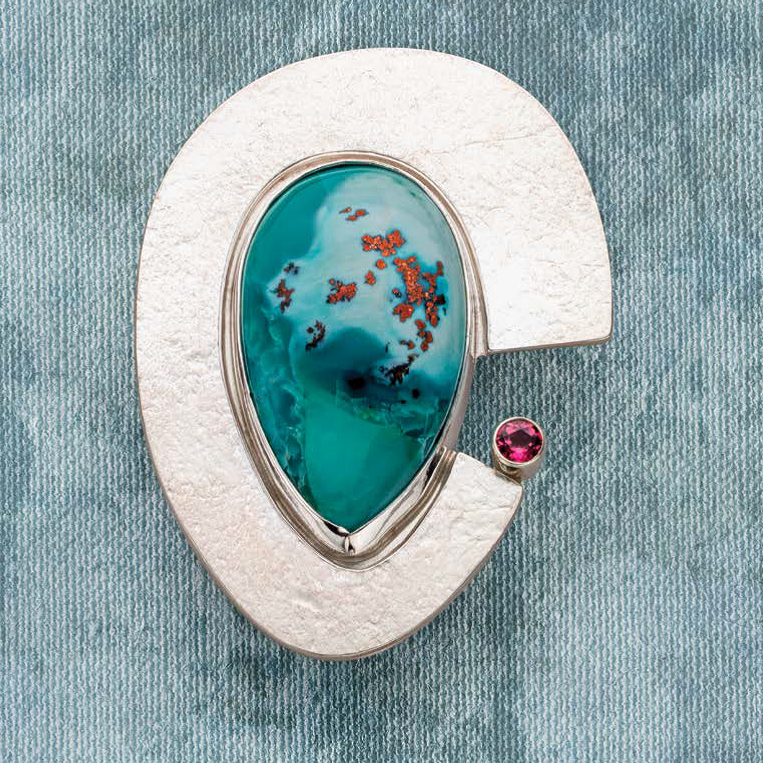 Looking back at all the Lapidary Journal Jewelry Artist issues of 2018, it’s impossible to ignore the cool jewelry designs in each issue. Let’s look back at some you can’t miss! Delicate, precise, orderly: lace strikes me as just the opposite of crazy. But I think whatever rockhound came up with the name crazy lace agate nailed it. 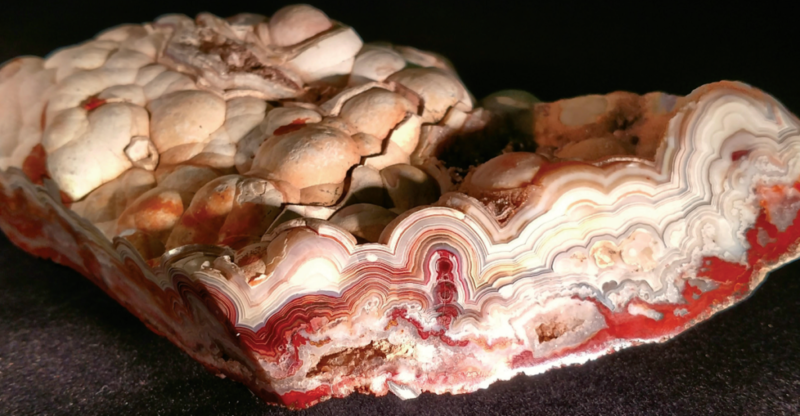 Those busy bands and restful pools of color make this one of the more dramatic agates you can find, and there are plenty to pick from. Like any true agate, this one is tough, hard, durable, and takes a great polish. It’s easy to recognize the patterning when you see it, yet every piece is different. Mined in Mexico, crazy lace is a classic. It also has flair to spare. 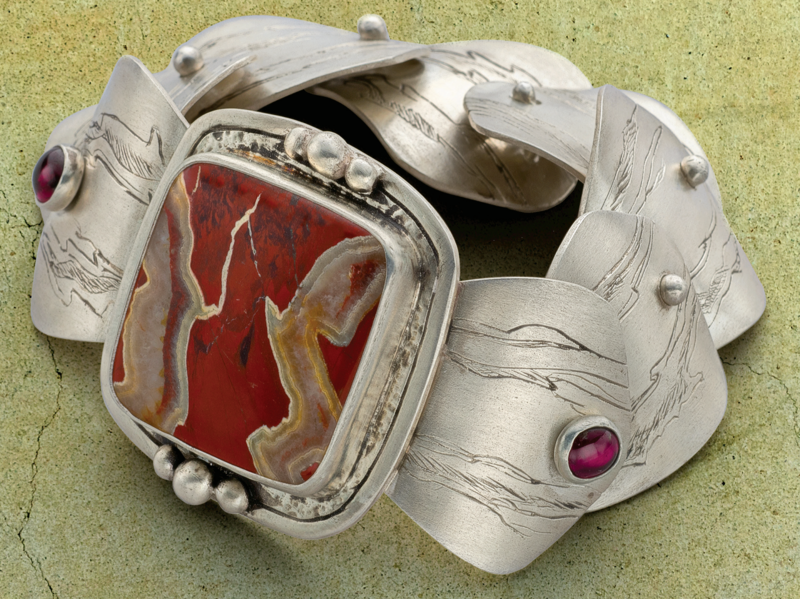 So does Janet Alexander’s inspired crazy lace agate and silver link bracelet. She bezel-set the agate using metalsmithing techniques, and added a little individual crazy-lace texture onto the metal clay links. She also designed each of these to be a little different in size or shape with the help of a cardboard template. To determine the number of links she needed, she put the template together using Glue Dots (affiliate link) so she could try it on her wrist. A “true” agate, in case you’ve asked, is at the least a kind of quartz called chalcedony. That’s what makes agates, jaspers, and related stones tough, hard, and polish well. Other “jaspers” and “agates” may be cut into beautiful cabochons. But if they’re not quartz, they may not be suitable for the jewelry use you have in mind. How they differ in appearance is a bit ambiguous, though. An agate is often considered a translucent stone and a jasper opaque, but the terms aren’t always used this way. Patterning and banding in particular are characteristics commonly associated with agate, but not necessarily. You decide — or just pick the ones that please you most, because Nature has produced a bounty of these stones in a continuous range of looks. Fossil whale bone is whale bone in which at least some of the original organic substance has been replaced by some more durable mineral. Most often that’s a quartz, especially a chalcedony such as jasper or agate. Sound familiar? And like some fossilized dinosaur bone or petrified wood, some fossil whale bone can be cut into durable gems that suggest abstract paintings or scenic landscapes. Or as in the piece above, a scenic underwater-scape. The main stone in John F. Heusler’s Ocean Voyage pendant is a piece of fossil whale bone John collected and cut himself. Its wavy/pebbly browns and deep blues suggest the seafloor to me. An exotic freshwater pearl peg-set with Epoxy 330 (affiliate link) and a bit of brightly colored coral collected many years ago fills out the marine tableau, with a few small diamond brilliants bubbling up from the top. Speaking of scenic stones and petrified wood, a real stunner started showing up on the American market a few years ago. 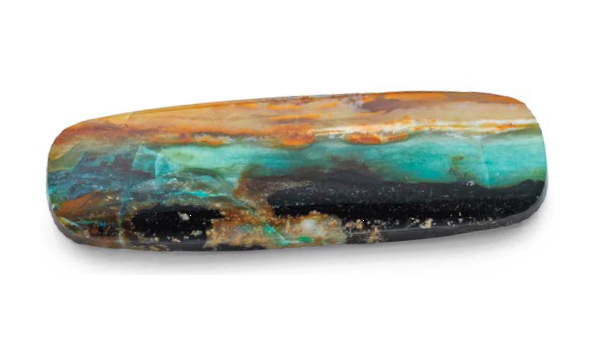 Mined in old lava flows on the Indonesian island of Java, this particular petrified wood is partly replaced by opalite and also contains copper. Having the same composition as quartz but a different structure, opalite isn’t as durable, though some cut stones have been stabilized to make them more so. The copper often produces lovely blues and greens — think turquoise and chrysocolla, also indebted to copper for their colors. In some stones, pure copper is also visible as shiny bits of metal. Lexi Erickson created this sleek pendant to showcase a piece of richly colored blue-green Indonesian petrified wood flecked with bits of native copper. She used Japanese art paper (affiliate link) and a rolling mill to impart a flecked texture to the silver. Although its luxuriant color often brings to mind a tropical ocean or lagoon, very rarely does turquoise form with a frothy surface. 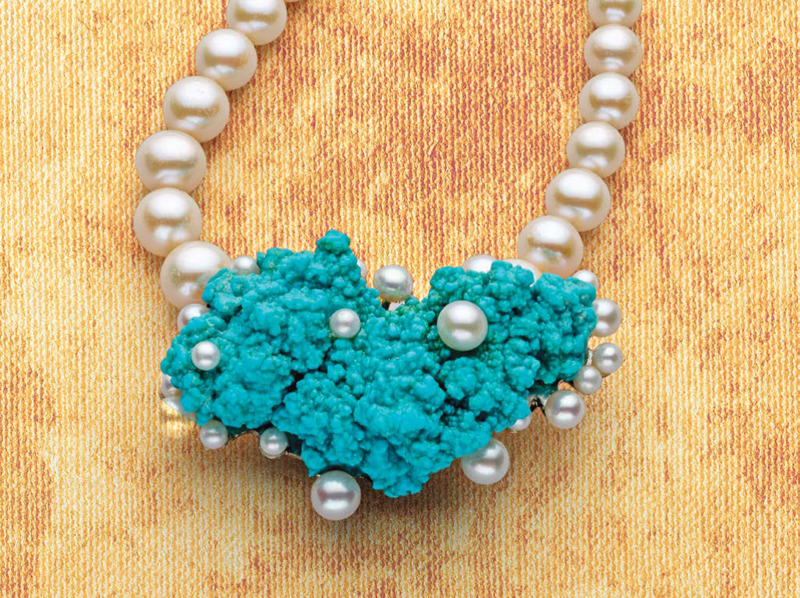 But it happened at least once in Nevada, and Betsy Lehndorff found herself the excited new owner of a beautiful “seafoam” turquoise nugget. She was so inspired by the stone she worked out a special way of setting pearls on it! What’s in Those Beguiling Waters? There’s another coppery way to conjure up the ocean. 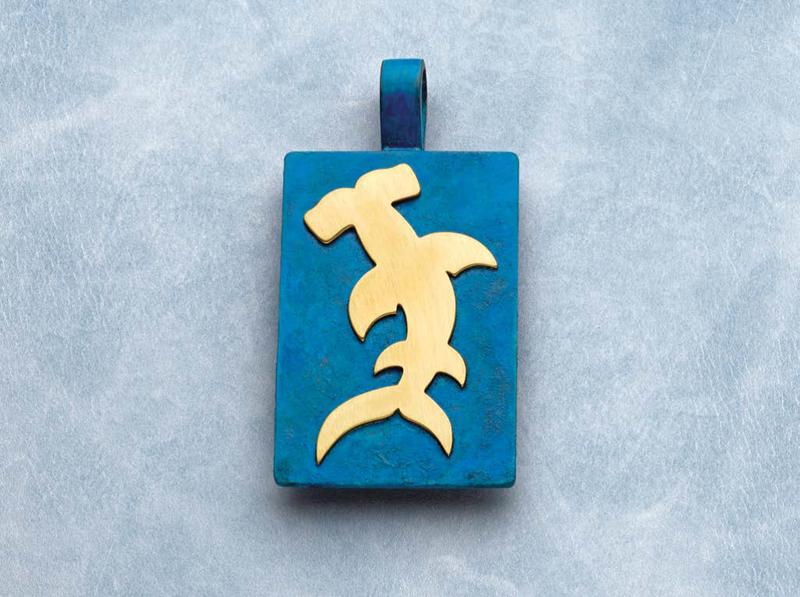 For his Scary Swimmer pendant, Roger Halas cut out a silhouette of a shark in brass, then patinated the copper back plate a rich ocean blue. He also produced a subtle texture on the plate that adds to the watery effect, suggesting a slightly uneven surface constantly in motion. The artfully patinated copper, sealed with clear lacquer (affiliate link) to preserve it, provides a perfect contrast to the polished brass shark silently gliding through the waters. Not everything turns copper blue or green. 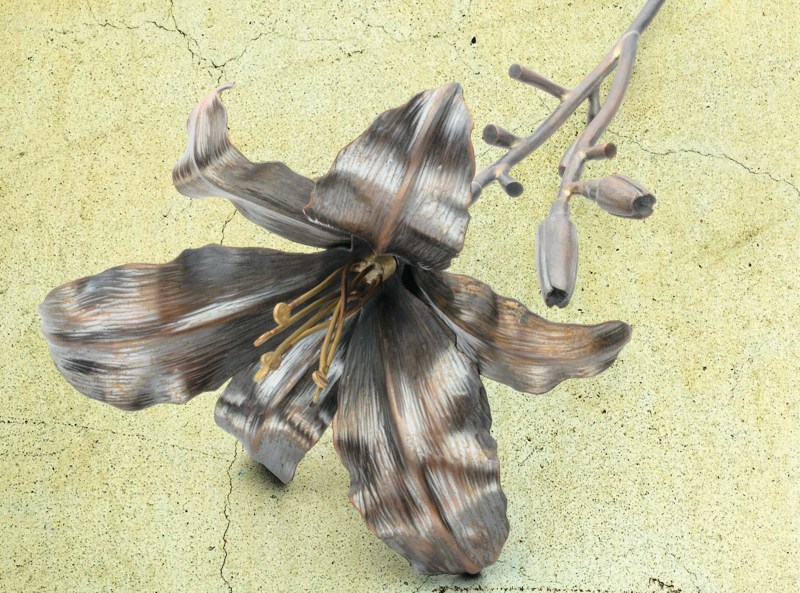 For his exquisitely formed copper Daylily, Brad Nichols chose liver of sulfur for a glimmering, dark finish. The extraordinary range and often brilliant colors of live daylilies are what usually attract us to this flower first. In this muted rendition, we’re drawn instead to its quieter but entrancingly graceful contours. 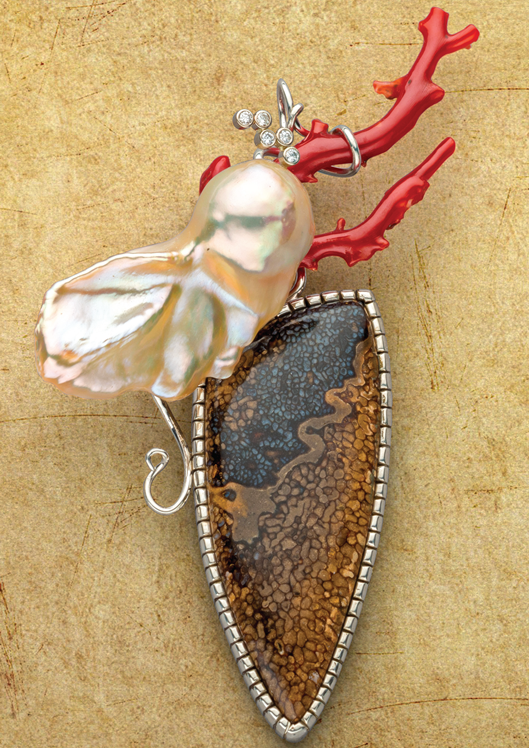 Each of these jewelry making projects and highlighted stones was covered by Lapidary Journal Jewelry Artist in 2018. Now you can get the full year’s issues with all that and much more in a convenient digital compilation that’s easy to search and store. Download the Lapidary Journal Jewelry Artist 2018 Collection and have them instantly at your fingertips. Every issue of Lapidary Journal Jewelry Artist presents outstanding designs, expert technical instruction, and thoughtful tips. 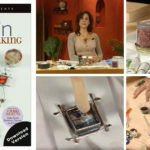 Plus, explanations and descriptions of tools, materials, techniques, and designs. Subscribe now and never miss an issue! Catch up with back issues and subscribe so you never miss out on Lapidary Journal Jewelry Artist!